I decided to teach a version of cauli-rice in my classes last month mainly because I have received a lot of emails and questions on Instagram about this phenomenon. It’s partly my fault because I posted on Instagram riced cauliflower from Trader Joe’s a few times. Some of the comments were, “I have some and I don’t know what to do with it.” Or “I can never find this at Trader Joe’s. It’s always out of stock!” Which is usually followed by tales of people hoarding cases of cauliflower rice. Or stores in different parts of the country limiting quantities of how much people can buy. I mean, seriously? It’s cauliflower! Pulsed in a food processor! Huh. To demystify cauli-rice — what is it, what does it taste like, how would you serve it, why should you eat it, why is it trending? Let’s start here. What is it? Cauli-rice is cauliflower cut to resemble rice and cooked until it’s tender thereby substituting for rice. It feels like you’re eating rice in the same way eating spaghetti squash or zucchini noodles feels like you’re eating spaghetti, i.e. it doesn’t. But cauli-rice is fluffy and tender and quite delicious and I can argue it is a much healthier food than white rice, and possibly even brown rice — both of which are very easy for me to overeat. Cauliflower, after all, is a super nutritious vegetable. Not only is cauliflower rich in antioxidants and vitamins, but it contains several anti-cancer compounds like sulforaphane and plant sterols such as indole-3-carbinol, which appears to function as an anti-estrogen agent. Together, these compounds have proven benefits against prostate, breast, cervical, colon, ovarian cancers by virtue of their cancer-cell growth inhibition. Sometimes after a big day of recipe testing and overeating, I want a lighter dinner. Perhaps I’ll make rice for my family, but I’ll make cauli-rice for me. My daughters like it just fine, but Mr. Picky much prefers regular rice. And I am not about to omit rice from our diets. Some people cannot eat or choose not to eat grains and cauli-rice is a great substitute, like in a Buddha Bowl or with a stir-fry. Others might be trying to lose weight and find that temporarily removing grains and eating cauli-rice is helpful, due to the very minimal carbohydrates. 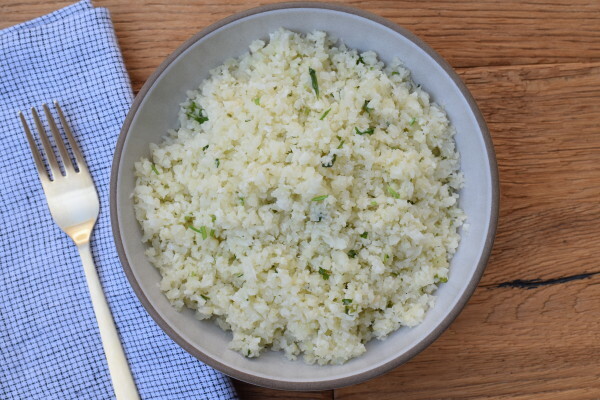 It is super simple to make a basic cauli-rice at home. And I think we all know I did not invent cauli-rice. I am merely showing you the way I like to make it. You just need a food processor, although a box grater would get the job done, albeit not as easily. You pulse florets in the food processor in quick pulses until the mixture resembles tiny rice-like pieces and then sauté and steam. I like to add flavor to the cauliflower in the way of fat, garlic and salt, but you can just sauté in a little olive oil with salt and call it a day. In my Cuban-inspired classes this month, I taught how to make basic cauli-rice, but then we added chopped cilantro at the end for a different twist. I love it like this. 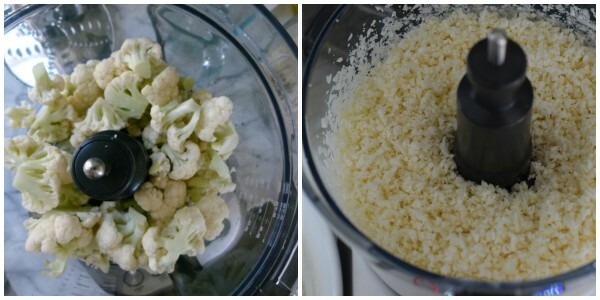 You can store the pulsed, raw cauliflower in the refrigerator for a few days, but then you need to commit and make it. I don’t think you can freeze the raw cauliflower without having blanched it first, but I can’t be sure. If anyone has successfully frozen raw cauli-rice, would you please let me know? I have also used cauli-rice raw in this Cauliflower Tabbouleh recipe, this Cauliflower Crust Pizza recipe and this cauli-rice version of my Spanish rice. And leftover cooked cauli-rice is delicious in a chopped salad the next day. Once you’ve tried basic cauli-rice, look for different colors of cauliflower and play around with purple, orange or green. 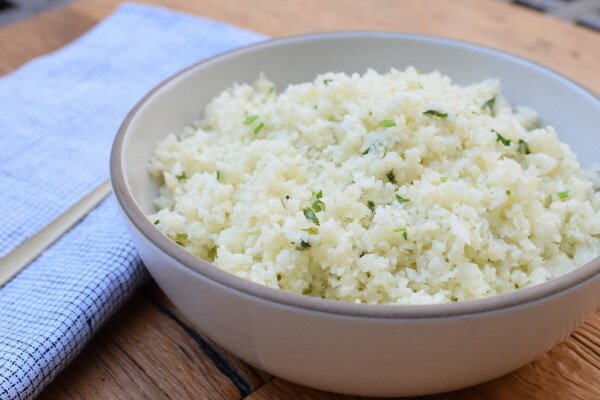 To make the cauliflower rice, place the cauliflower in a food processor fitted with a metal blade. Pulse about 15-20 times (short, quick pulses) until you get very small pieces (resembling snow or rice). If you are using premade cauliflower rice, fresh or frozen, skip this step. Heat the oil and butter in a large sauté pan over medium heat. Add garlic and sauté, stirring constantly for about 30 seconds or until fragrant. Add the cauliflower to the pan and toss to coat with the oil/butter and garlic. Season with salt. Sauté for a couple of minutes, then cover and steam on low for 5-10 minutes, or until desired tenderness is achieved. ** If you don’t have a lid, just sauté, stirring often until desired tenderness. 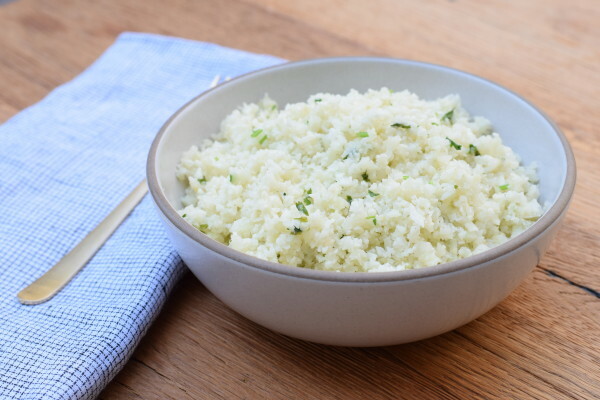 For a cilantro cauli-rice, add chopped fresh cilantro leaves and tender stems to the finished cauli-rice. ⅓ cup cilantro, chopped, is a good amount or feel free to add more. 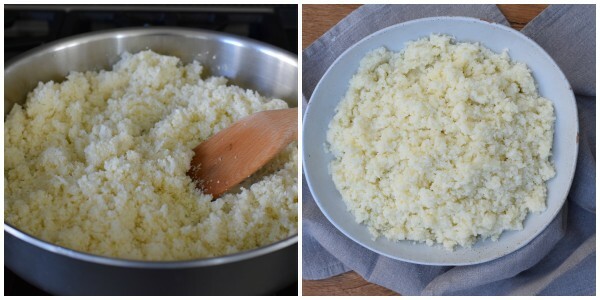 **If using frozen riced cauliflower, no need to cover and steam. Continue stirring frozen cauliflower until defrosted and excess water has evaporated, a couple of minutes. oye hermano q buena tu pagina… son muy cierto esos consejos e tenido novias pero en algunas ocaciones e fallado con las chicas y despues de aver leido tu pagina me e dado cuenta q e cometido algunos errores de los q has comentado! just fine, but when thawing it gets wet so I do use a fine mesh sieve to drain so it’s not soaking in its own ice water during the process. I’ve made this once before but I really didn’t like it. Decided to try your recipe since everything I’ve made from this site is wonderful. Not surprised then that this recipe is great! 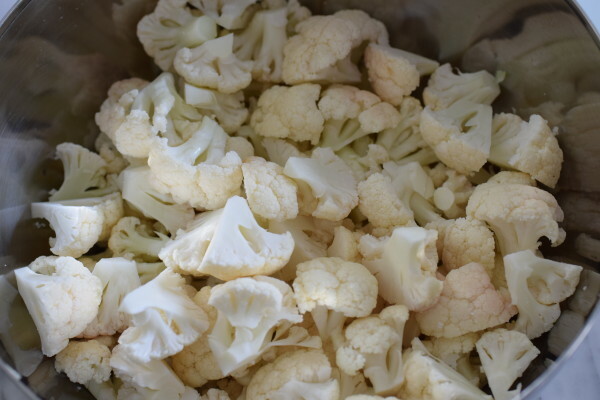 I almost ate the whole head of cauliflower by myself – lol! Need more recipes GF…and how do I eat in Italy if Celiac?! You can adapt almost anything to be GF! And eating gluten-free in Italy is not a problem if you focus on beans, lentils, potatoes and rice. The problem is that you are Celiac, not just GF, so cross-contamination would concern me. I would be very clear about that when ordering in restaurants!